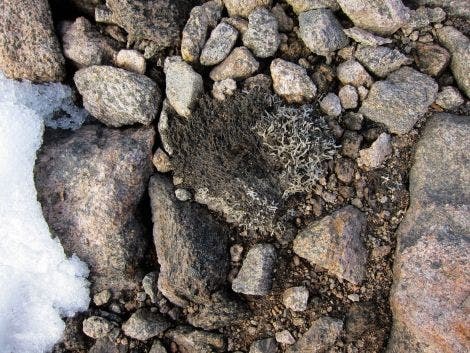 Ancient moss in Canada’s Arctic that hasn’t seen the light of day for at least 40,000 years (and quite possibly up to 120,000 years) is now cracking out of ice caps. Ancient moss exposed by retreating ice at the edge of Baffin Island’s ice cap. Credit: Gifford Miller, University of Colorado Boulder. The astounding findings were made by researchers at the University of Colorado led by Simon Pendleton who traveled to Canada’s Baffin Island to investigate ice melt. The region is characterized by deep fjords and high plateaus, the latter of which is covered in ice caps. Like the rest of the Arctic circle, the region is experiencing warming at a rate twice the global average — so much so that plants and moss that haven’t been exposed since the last ice age are now starting to creep through the melting ice. The thawed plants wither and die in a matter of weeks after they break free from the ice that covered them for thousands of years, but luckily the researchers collected some of them before this happened. The research team collected a total of 124 samples from 30 sites around the island, all from within a meter from the edge of the ice cap (the most vulnerable part of the ice cap to melting). Using radiocarbon dating technique, the researchers estimated that the ancient plants are at least 40,000 years old. This age seems to be backed up by measurements of minerals from nearby rock that look like they been continuously covered by ice for at least the last 40,000 years. What’s more, according to Pendleton, the plants could be much older than that. Writing in the journal Nature Communications, the researchers say that the level of warming in this last century is likely greater than in any century in the last 120,000 years, meaning the plants could actually be that old. “We know there is dramatic change occurring and will continue to occur, but I don’t know that we were expecting to find evidence that we’re now seeing landscapes and temperatures similar to that of the last interglacial period,” Pendleton said. Even with the naked eye, the changing landscape of Baffin Island is obvious. Year to year, since Pendleton first came to the island in 2005, he has seen ice gradually retreating from the edge of the ice cap. In some regions, the current edge of the ice cap is up to a football field’s length away from the previous edge from only a couple years ago. As the ice retreats even further, more Arctic landscape will become exposed. Studying plant life that’s been buried for thousands of year is quite an achievement for science — who knows what we may learn from it. But it’s all at the expense of a warming planet that threatens countless species and coastal communities. “To be able to see it and walk on the ice cap and understand we’re in a time that’s exposing landscapes that haven’t seen sunlight in possibly 120,000 years, that has a profound effect,” Pendleton said.